In his memoir, Norman Hallendy recounts his journeys—spanning almost 50 years—with the people and landscape of Canada’s Arctic. An Intimate Wilderness: Arctic Voices in a Land of Vast Horizons is the memoir of Norman Hallendy, a long-serving Canadian civil servant, who took the time during almost a half-century of travels through the Arctic to listen to Inuit elders and record their stories, many of which recount the time before the Inuit were settled in permanent communities in the 1950s. Through text and images, including photos and drawings by the author, the book explores justice, rituals, magic, dreams, states of mind, as well as hunger and death. He professes to offer a glimpse of a world that the Inuit kept to themselves. While Hallendy’s travels in the eastern Arctic and time spent with the Inuit spanned a significant period of time, the comparison of Hallendy to the great Danish/Greenlandic explorer Knud Rasmussen—as William Fitzhugh, the director of the Arctic Studies Center at the Smithsonian Institution, makes in the book’s introduction—is unfortunate. Rasmussen’s epic journeys across Greenland and North America by dog team included a three-year, 30,000-kilometer trip during which he and his colleagues lived off the land and sea while visiting Inuit camps. Many of Hallendy’s trips were short boat or helicopter rides, sometimes at the end of government business related to his housing portfolio. Further suggesting that “no one has explored the connections between Inuit conceptions of place, geography, and philosophy in such depth,” just isn’t so. I’m thinking of oblate missionary Émile-Fortuné Petitot, author of Les grands Esquimaux (1887); Edmund James Peck, who, at the request of pioneering ethnographer Franz Boas, spent 11 years on Baffin Island documenting the pre-Christian beliefs of the Inuit; Diamond Jenness, who lived with an Inuit hunter and his shaman wife from 1914 to 1916; Guy Mary-Rousselière, who lived among the Inuit on Baffin Island from 1937 to 1994, recording their songs, narratives, and mythology—the list of ethnographers is very long, and not one of them gets any mention in this book. It’s too bad because as a memoir, the book is, at times, a charming read. There are stories that arise from the friendships Hallendy forged with Inuit elders on the southwest coast of Baffin Island, snippets of conversations he had with some of them, and descriptions of fascinating places he was introduced to during his trips north. But most of the stories don’t delve very deeply into the traditional Inuit world that was ravaged by disease, starvation, residential schools, and the dismal housing conditions that were never resolved during Hallendy’s time in government. If you’re looking for more contemporary Inuit concepts of place, geography, and philosophy, consider The Meaning of Ice: People and Sea Ice in Three Arctic Communities, edited by Shari Fox Gearheard. It was written with more than 40 Inuit, Iñupiat, and Inughuit. Like Hallendy’s book, The Meaning of Ice offers an unfiltered view of Inuit life, but it comes directly from the Inuit themselves and provides a point of view that we should be promoting and reading. 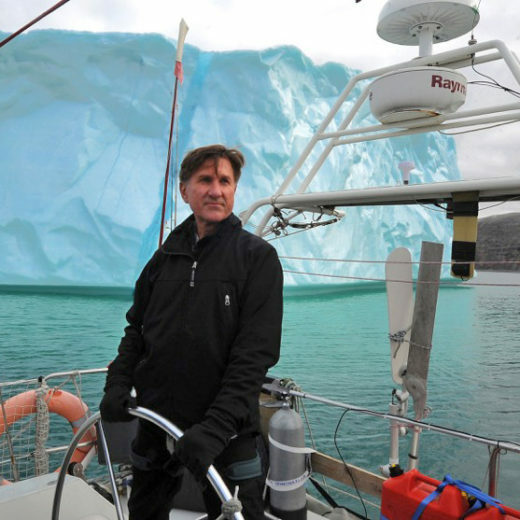 Ed Struzik is an award-winning author, photographer, and journalist who has been writing about the Arctic for more than 35 years. He is a fellow at Queen’s Institute for Energy and Environmental Policy and a regular contributor to Yale Environment 360, an online magazine that offers opinion, analysis, and news reports on global environmental issues. Struzik’s latest book is Future Arctic: Field Notes From a World on the Edge from Island Press. Cite this Article: Edward Struzik “Book Review: An Intimate Wilderness,” Hakai Magazine, Dec 30, 2016, accessed April 25th, 2019, https://www.hakaimagazine.com/article-short/book-review-intimate-wilderness/.